*** !!!!! *** As my craft studio is locating in Melbourne, please note that delivery may take up to 2 weeks from Australia to US. ***!!! *** Unisex leather belt is made to last from 9/10oz (4 mm thick) Italian veg tanned leather. Hand cut, Hand tooled, beautifully hand dyed, hand punched, finish coated and polished with bee wax for water-resistant. The Belt is 1½" (3,5 cm) wide, edges are rounded & burnished, the reverse side is coloured, treated and sealed. Brass buckle made in Australia. Not stitched but embossed with stitch imitation. 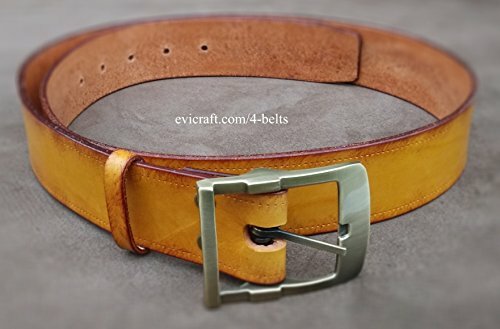 contact me if you need size more than 46"
If you have any questions about this product by Evi Craft, contact us by completing and submitting the form below. If you are looking for a specif part number, please include it with your message.